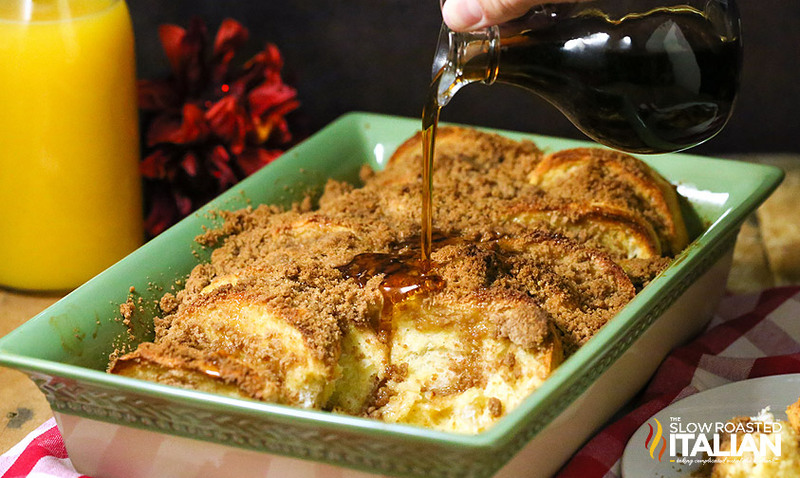 This Overnight Gingerbread French Toast Casserole recipe comes together in just 20 minutes. It is the perfect make-ahead breakfast to create an extra special holiday morning. Prepare the night before and toss it in the oven while you get ready for the day. This casserole is bursting with gingerbread flavor and layered with the perfect spiced streusel topping. It is destined to be on your menu again and again! Can you believe it is November already? I am nearly in heaven. This is my season. The weather is cooler, soon we will start decorating the house, putting up our favorite tree decorations and getting in the spirit of the season as we enjoy these holiday moments. Christmas morning breakfast. When I had more time on my hands (you know, before I had my daughter) I would make the most divine cinnamon rolls for Christmas morning. They are insanely delish. But alas, holiday mornings are packed with excitement that I do not want to be missing as I am standing in the kitchen. Our new holiday standard has become overnight breakfast casseroles. 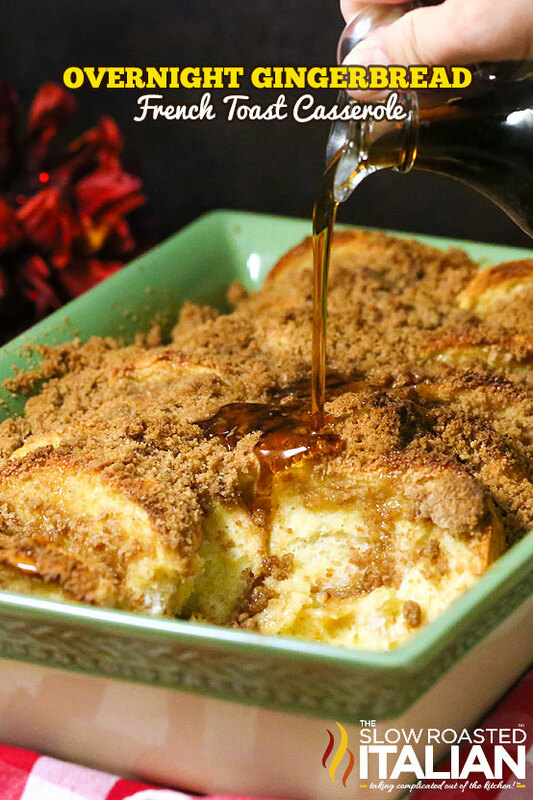 I have just found my new love and the whole family has voted that this Overnight Gingerbread French Toast Casserole will be Christmas morning breakfast. I can not tell you how excited I am. 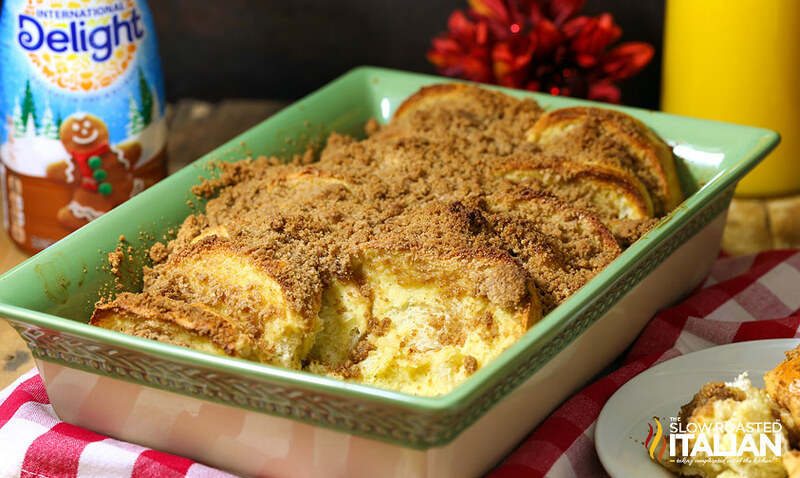 Ok, first the french toast casserole could not possibly be easier. It comes together in 20 minutes and is made ahead for the next morning. Just top with streusel and bake. Seriously could not be more simple, unless someone else is making it. The french toast layer comes together with just 3 ingredients; bread, eggs and creamer. I chose the magnificently flavorful Gingerbread Latte flavor from International Delight which is bursting with flavors of ginger and spice. It is amazing and really comes through in the final dish. The french toast is covered with a simple spiced streusel topping that is perfectly sweet. It is so easy to put together and tastes amazing. The casserole is the perfect texture. Crisp on the top and cooked to perfection. I prefer my french toast to be crisp and this one does not disappoint. I just add a pat of butter to the top and it is absolutely perfect. Chad on the other hand is kind of like Buddy from the movie Elf and definitely puts maple syrup on his french toast, sugar is a food group, right? Either way it is insanely delightful! Prepare 9"x13" baking dish by generously buttering the entire dish. Set baking dish aside. Slice French bread approximately 1-inch thick. Arrange slices in your prepared baking dish in 2 rows, overlapping the slices. Set dish aside. In a large bowl whisk eggs and creamer until blended. Pour mixture over the bread slices, making sure they are covered evenly with the liquid. Spoon some of the mixture in between the slices if necessary. I like to make sure all my slices are good and coated. Even dunking them in the mixture sometimes. Cover with aluminum foil and refrigerate over night. Combine the remaining ingredients in a medium bowl. Mix with a fork until mixture is thoroughly combined. Sprinkle streusel topping onto french toast making an even coating over the top. Bake 40 minutes or until puffed and golden brown. The streusel topping refers to the cinnamon, ginger, and nutmeg mix from prior step.